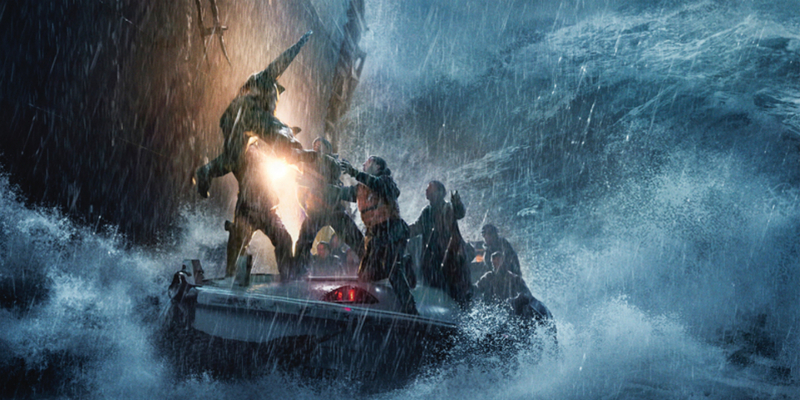 In going to the theater to see The Finest Hours be sure to bring a jacket or sweater or even a life jacket. The new film by director Craig Gillespie (Lars and the Real Girl and Fright Night) from a script by Scott Silver, Paul Tamasy, and Eric Johnson, sets one in Wellsfleet, MA in a cold snowy winter with an angry ocean. 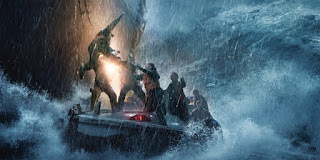 Based on the book by Michael J. Tougian and Casey Sherman called The Finest Hours: The True Story of the U.S. Coast Guard's Most Daring Sea Rescue, it recounts how four young men in 1952 over came treacherous seas, wind and waves to save a tanker's crewmen. The film puts you right in their dilemma with a little bit of romance to soften the blow. Chris Pine plays Boatswain Mate First Class Bernard Webber. He lives with memory of an ill fated rescue and one of the town's fisherman and some of his Coast Guard's mates remind him of it. It almost affects his confidence, but Bernie is a good guy and steadfast in his work. So when his boss Chief Warrant Officer Daniel Cluff (Eric Bana) tells him to go help tie up the local fishing boats he does it despite the pressing need to rescue the SS Fort Mercer that broke in half from the storm and floundering off Nantucket. They soon discover that another tanker, the SS Pendleton had also split in half and they are five miles off the coast from them. Cluff tells Bernie to pick a crew and take the small surf boat USCGC Yakutat over the sand bar and see what they can do. Everyone knows that getting over the sand bar in a storm is a chancy operation with a high chance of failure due to the high waves. It's one of the most exciting moments of the movie. While this is going on, the crew of the Pendleton were shocked to discover the big bang they heard was their tanker splitting in half taking the captain the rest of the crew to the deep. There's a terrific scene when a crew member goes running to the bridge to discover there is no bridge or the rest of their ship. The mission to stay afloat falls on Ray Sybert (Casey Affleck) who runs the engine room. He's a bit of a loner but knows the ship like no one else. Some of the hot headed survivors want to drop the life boats and abandon ship, but Sybert steps in and shows them that they will never survive that way. They have to figure out how to build a tiller and hope to hit a shoal before the ship sinks. They do manage to send a message for help. The rescue, and the efforts of Sybert to keep the crew safe is pretty amazing, but there are lots of slow, cold moments. Setting up the romance of Bernie and Miriam (Holiday Grainger) makes the emotional stakes for Bernie wanting to survive. The real life couple managed to stay married for 58 years after this event. Chris Pine's Bernie is almost a little too dull and laid back, but maybe that's the way Bernie was in real life. Affleck fare's better was the taciturn Seybert who discovers his own sense of leadership while MacGyvering the ship to the shoal. Since this is Disney movie, you can be sure there is limited curse words, and not a dry eye in the house heroic. The movie is a nice honor to those who serve in the Coast Guard and if nothing else, it's worth a look.